Be the first to share your favorite memory, photo or story of Gerald "Gerry". This memorial page is dedicated for family, friends and future generations to celebrate the life of their loved one. 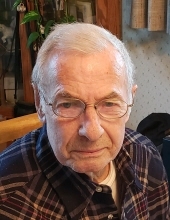 Gerald Oscar Rustand age 82 passed away peacefully at his home with his wife Carolyn by his side on Saturday, April 13. Gerry was born on May 17, 1936 at his home on Sunrise Rd in Blaine, WA to Oscar and Enes Rustand. He grew up there and attended Lynden schools. He worked for many years as a heavy equipment operator and proud member of the Operating Engineers Local 302 in Whatcom County, Friday Harbor, and Alaska. Chopping wood and running the chainsaw were tasks that Gerry loved. Carolyn and Gerry were wed in October of 1987. They lived on Pole Rd and grew dahlias each summer. They would take flower bouquets to church every Sunday when the dahlias were in bloom. Gerry loved to go riding on his motorcycle with his wife Carolyn. One summer while riding, going 50 mph, his front tire blew and they went flying into the moss along the Glacier Rd. They sat on their backs catching their breath thanking God for landing both in the soft moss along the road. Gerry loved to spend time with his family and friends. He was a devoted member of his church New Life Fellowship. He was always willing to give someone a helping hand and could be counted on to repair nearly anything. Gerry is survived by his wife Carolyn Rustand (Trapeur), his brother Art (Lois) Rustand, his sisters Rose Gregory, Arlene Metcalf and Milly Kriz, his sons Greg (Mary Lee) Rustand and Bill (Sandy) Knutzen, his daughters Daleen (Rick) Weidkamp and Roxanne (Wayne) Hancock, as well as numerous grandchildren and great grandchildren. He is preceded in death by his parents Oscar and Enes Rustand, his brothers Richard, Melvin and Wayne Rustand, his sister Dorothy Everts, and his daughter Kathy Rustand. You are invited for a time of viewing and visitation on Friday, April 19, 2019 from 5 to 7 PM at Gillies Funeral Home, 202 Front St., Lynden. Please join family and friends for the Graveside Committal on Saturday, April 20 at 12 p.m. noon at Ten Mile Cemetery, 6268 Medcalf Rd., Lynden, WA 98264 followed by the 1 p.m. Memorial service at New Life Fellowship, 810 E Pole Rd. Memorials are suggested to the National Rifle Association at nra.org/donate or New Life Fellowship, 810 E Pole Rd, Lynden, WA 98264. Funeral arrangements are entrusted to Gillies Funeral Home and Cremation Services. To send flowers or a remembrance gift to the family of Gerald "Gerry" O Rustand, please visit our Tribute Store. "Email Address" would like to share the life celebration of Gerald "Gerry" O Rustand. Click on the "link" to go to share a favorite memory or leave a condolence message for the family.